My culinary attentions of late have included many gluten-free – grain-free options. It is a tricky combination of restrictions. I could not use the typical rice component for the filling, nor could I include a panade (binder) because the usual ingredients are wheat based or grain based. My solution for a binder substitute – vegetable flakes! One day, my husband and I were scratching our heads trying to come up with options for our daughter’s grain-free, gluten-free dietary restrictions, and bingo! We came up with this moment of brilliance! After rehydrating dried vegetable flakes, I pureed them into a paste and added them to the ingredients. It not only added the moisture we needed to bind the pork and beef mixture together, but it also added an extra boost of flavour. In order to facilitate all the food restrictions and use the beautiful cabbage to its best advantage, I adopted an interesting alternative to cabbage rolls: “The Cabbage Dome”. CHEF TALK: I always recommend cooking or frying a small portion (meatball sized) of the mixture, and then taste it to determine if you have the correct seasoning requirements before you start to build the dome. 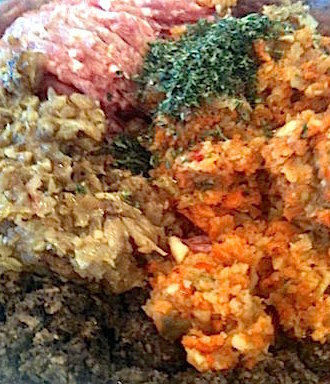 (see below) This tip also applies to meat mixtures for meatloaves, meatballs, hamburger or any other alternative mixtures (see veggie burgers).This is a recipe that has been adapted from a brilliant recipe from Laura Calder’s stuffed cabbage. This version is entirely gluten free and grain free. 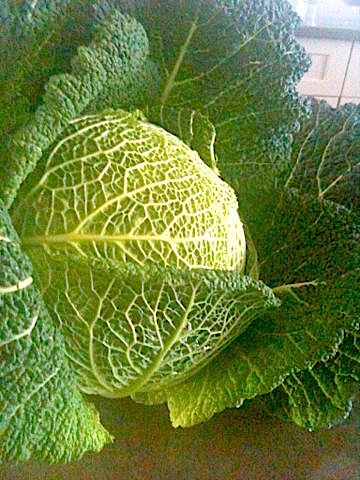 Prepare the Savoy Cabbage: core the cabbage and peel away the leaves one by one. The outer leaves will have a larger vein that should be trimmed or cut out so that it is easier to assemble the stuffed cabbage. The leaves get too small as you get to the heart of the cabbage: shred those to add to the filling. Set aside the leaves and the shredded cabbage. Blanch the larger cabbage leaves for a few minutes to soften. Place the blanched leaves in ice water to stop the cooking process. Drain the leaves and pat them dry with a paper towel. Set them aside on a baking sheet until assembly time. Prepare the dried vegetable binder (panade): Place the dried vegetables flakes into a small bowl, and pour the hot water over them to rehydrate for at least five minutes. Drain any extra water. 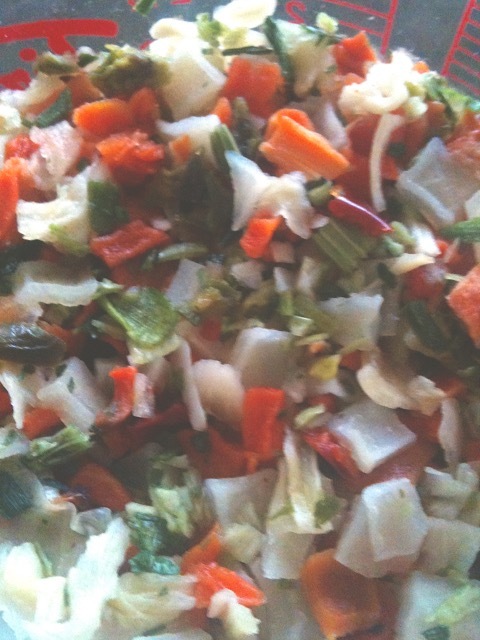 Chop the rehydrated vegetable mixture finely. Set aside. Heat the butter and olive oil in a skillet and gently fry the onion and shallot until transparent, about 5 minutes. Add the garlic, mushrooms, reserved shredded cabbage, thyme and parsley. Add the tomato paste and the rehydrated vegetable mixture. Cook another five minutes. Add the smoked paprika and season generously with salt and pepper. Cool slightly before adding it to the ground meat. Add this mixture to the ground beef and sausage meat in a large bowl and mix thoroughly with a fork. Take about a teaspoonful of the mixture and fry it in the frying pan. Taste it and adjust the seasoning if necessary. Once I was satisfied that the mixture was seasoned appropriately, it was time for assembly. 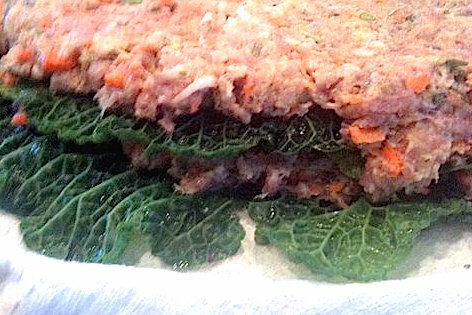 Basically, the idea is: you are building layers from the cabbage leaves (blanched to soften), and layers of meat and vegetable mixture, starting with the largest leaves and ending with the smaller leaves, with decreasing proportions of meat/vegetable mixture as each layer is built. 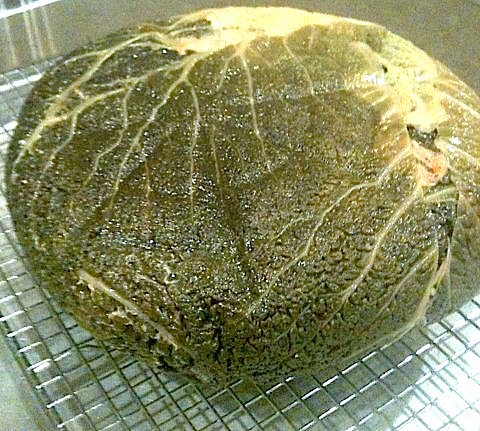 Once the top layer is completed, carefully pull the edges of the cheesecloth or tea towel tightly around the cabbage dome, twisting tightly to form a large round ball. Tightly tie a piece of butcher twine around the top of the cheesecloth bundle. Place the dome on a rack in a pot deep enough to hold the cabbage. Pour tomato juice in the bottom of the pot (about 2 cups). Cover the pot tightly and steam until cooked (about 45 minutes to one hour). If you wish, you may use a digital thermometer, and steam, until it registers an internal temperature of 71°C/160°F. Using a pair of tongs, lift the stuffed cabbage carefully out of the pot and let it cool for a few minutes on a rack on the counter before removing the cheesecloth. Place a serving plate upside down on top of the cabbage dome, and turn the stuffed cabbage and plate carefully over to expose the cabbage dome’s bottom. This is now the best (or presentation) side. Let it sit for a few minutes to cool slightly for ease of cutting. Cut the cabbage dome into slices or wedges to serve, together with the enriched broth remaining in the pot as a flavourful “jus”, or serve it with a simple tomato sauce. As always, if you give this recipe for this gluten free, grain free Stuffed Cabbage a try, please come back and leave me a comment below with your feedback. This will be a spectacular presentation for your guests. 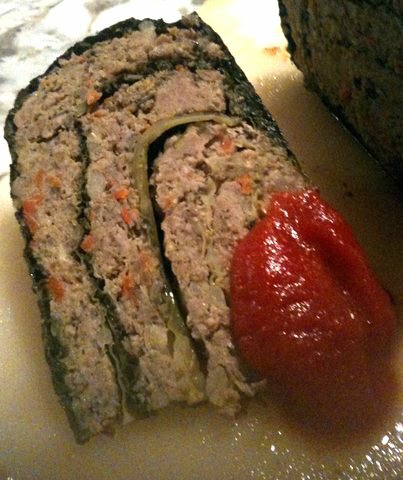 A whole new approach to cabbage rolls! Have fun with this gluten free, grain free recipe.